The UBHA Hearing scheduled for tonight, November 10th, has been cancelled. We apologize for the inconvenience and will notify everyone when the meeting has been rescheduled. Too many folks in Muncie, particularly those downtown, the past seventeen months may have seemed like an eternity; but they will have yielded decades of improvement in business development and quality of life. It all began with fulfilling a federally-mandated requirement from 1972 that our combined storm and sanitary sewer lines be separated, ending the result of sewage overflow being discharged into the White River, following rainstorms. Later, other federal requirements, such as public access under the ADA, were becoming unavoidable issues. While these were expensive propositions unto themselves, visionary community leaders saw within them an opportunity: Sure, for the sewer projects, we could have made a simple saw cut in the asphalt, and trench in a new pipe; and simply paved the non-ADA compliant sidewalks with asphalt, and told all the businesses that they could not use the sidewalks for outdoor dining, citing the federal mandates; but, what if in addition to fulfilling these federal requirements, we could also make significant improvements that would improve both our ability to cultivate a healthy downtown business environment, and improve the quality of life for Muncie residents? In 2012, Mayor Tyler’s administration, in concert with a number of local business and development partners – the City of Muncie, Muncie Downtown Development Partnership, Muncie Sanitary District, Flatland Resources, the Muncie Redevelopment Commission and Delaware-Muncie Metropolitan Planning Commission and others – held a series of public forums and focus groups to identify the various assets, opportunities, and challenges in the downtown area, which hadn’t seen a major infrastructure overhaul in several decades. They also asked what people wanted to see developed and improved downtown. The responses ranged from the easily-predictable, such as increased parking, safer sidewalks, and bike-friendly streets; to the more audacious, such as a new hotel, a parking garage, and rain-garden storm drainage. From that, the Streetscape initiative was cultivated. In the three years that followed, the city was able to partner with the ARC of Indiana to develop and build the Courtyard Marriott Hotel and Erskine Green Training Center, build a new parking garage, fulfill many of the ADA requirements, and add bike lanes throughout the downtown area (making Muncie one of only ten Indiana cities to earn a Bicycle Friendly Community designation). The real challenge, however, for downtown business owners, residents, and patrons, would come the following year. Streets throughout the area – some of which hadn’t been excavated in a century – would have to be torn up and modernized. Multiple meetings were held to poll merchants along the affected areas, and offer them a choice: Perform all of the work in one fell swoop over the course of a year, essentially “ripping the band-aid off;” or spreading the work across two summers, and opening the streets back up for the holiday shopping season. The latter received near-unanimous approval, and while it resulted in increasing the overall project cost, the city accommodated the merchants’ wishes. 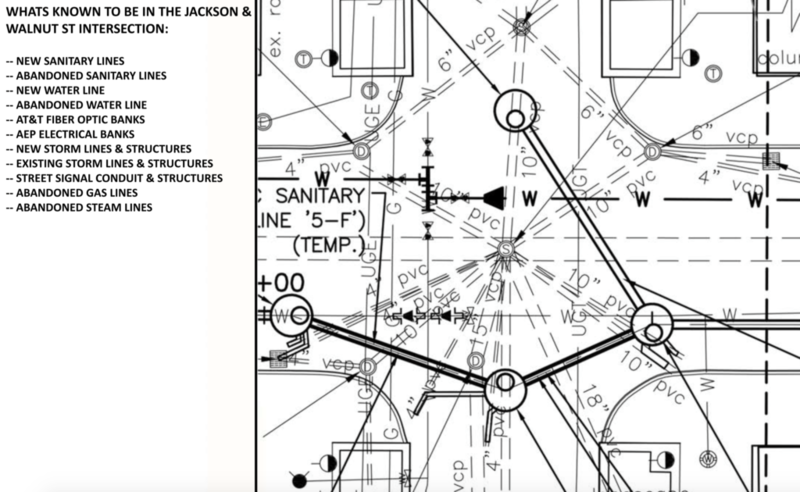 While the city had a sewer and pipe infrastructure “atlas,” many of the additions made over the past several decades hadn’t been adequately documented by the utilities that made them. As such, nearly every dig encountered heretofore unknown assets. Workers found long-abandoned steam trunk lines, water and sewer lines, electrical conduits, and even the occasional underground vault. Every time that happened, work would grind to a halt while various entities were consulted to determine what changes had to be made either remove obsolete elements, and accommodate existing ones. Nevertheless, in October of 2015, the work was packed in, on schedule, and all of the roads were opened up for the holiday shopping season. In April, 2016, work commenced and that was when project managers learned that the previous year was just an appetizer. This next phase involved tearing up the Jackson and Walnut intersection, one of Muncie’s oldest intersections. Abandoned (or not) gas, water, sewer, sanitary, steam, and other lines – even an internet fiber-optic backbone line, connecting Columbus, Ohio, to Chicago – emerged at every level [image]. Upon the discovery of each of these, various utility companies needed to be consulted before work could commence. Again, though, thanks to the planning and cooperation of the partners involved, those issues were able to be resolved in a matter of days, instead of weeks. Throughout this entire process, the project management team was able to address every obstacle and maintain both the original timeline and budget. The significance of this cannot be understated. Other community projects have been hindered for months, or even years, by such delays. In Muncie’s case, we will finish every aspect of this project undertaken as intended, and according to the timeline originally laid out. Completing this massive accomplishment is something that our city rightly deserves to be proud of. 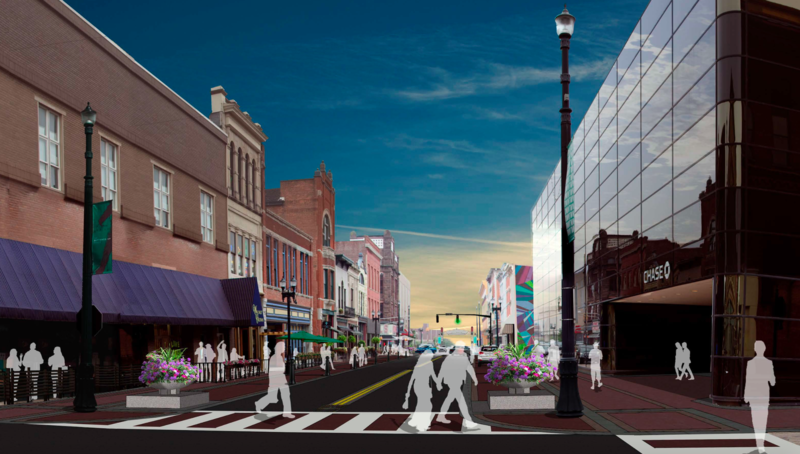 We took a number of federal mandates, and turned them into an opportunity to develop monumental downtown improvement projects that will benefit our community for years to come. Few cities can claim as much. Not stopping there, the team that heralded this project expanded to include marketing and media professionals that will assist downtown merchants with maximizing the promotional opportunities that this project completion offers, ahead of the 2016 holiday season. To address long-term concerns, The Muncie Action Plan’s Muncie Neighborhoods’ project is developing a Downtown Neighborhood group, that will provide numerous collaborative opportunities. The DWNTWN area has come a long, long way since the old “Walnut Plaza” days of my youth. The most dramatic growth-friendly changes in decades, however, have all happened in the past year. Thanks to the new hotel and parking garage, the convention center is doing booming business, bringing all sorts of new people to visit and shop the area. New retail and restaurant businesses have opened. It really is an exciting time, and it’s all the result of clear vision, quality planning, continuous cooperation, and lots and lots of hard work. Be proud Muncie. It’s good to be here. Ty Morton is a downtown resident, and runs Tylonius Studio, an online media design and development agency. "Muncie Bike Fest is our brand new cycling event! In conjunction with the city of Muncie and Bike Muncie, Cardinal Greenways presents Muncie Bike Fest, an exciting three-day event of cycling, entertainment, and recreation on August 12th, 13th and 14th. The first-ever Muncie Grand Prix Circuit Race is sanctioned by USA Cycling. Led and non-led bike tours, demonstrations, and festivities are planned for the entire week-end. The event begins Friday evening, August 12th with a Critical Mass Group Community Group Ride from the Historic Wysor Street Depot to Downtown Muncie for fun and entertainment. Saturday the 13th is Tour Day, an entire day of self-led biking tours of Cardinal Greenway and White River Greenway, and additional led tours of the interesting sites of Muncie. Plus they’ll be tons of fun, food, and entertainment at the Wysor Street Depot and Downtown Muncie. Sunday, the 14th is Muncie Grand Prix Race Day with a 0.7 course through the heart of Downtown Muncie, sanctioned by USA Cycling. Come enjoy three days of biking, festivities and fun. Muncie Bike Fest 2016 is sure to be AMAZING! For more information about this event and registration, go to munciebikefest.com." Dannar, LLC, makers of the first of its kind Mobile Power Station® (MPS), demonstrated its production unit at Joint Base Andrews (Andrews Air Force Base) in Maryland on July 14 to dozens of high ranking U.S. Department of Defense (DoD) and other Federal Government officials who have been meeting with Dannar for the past 18 months. In addition, Dannar was the headline sponsor of the 4th Annual Military Mobile Power Summit in Alexandria, VA, July 12-13. That event focused on the efforts to advance mobile power and energy capabilities in the military and highlighted initiatives to reduce energy footprint. “We were very pleased with the comments and opinions of a wide range of military personnel we encountered both at Andrews and at the Summit,” said founder and CEO Gary Dannar. “For well over a year, we have been meeting with various military leaders that are specifically focused on providing clean operational energy at military bases across the country. Personnel from various branches of the military were afforded the opportunity to test drive the MPS at Joint Base Andrews, providing invaluable feedback on the maneuverability, flexibility and usefulness of the multi-functional machine. The MPS is a self-propelled power generator, built to provide contingency power for off-road infrastructure maintenance and disaster response. The MPS carries as much as 715 kWh of on- board electricity via high-efficiency, lithium-ion battery packs, as well as an auxiliary power unit for regeneration of those batteries. In an emergency, the MPS can provide off-grid electricity as well as re-charge electric vehicles and tools. Combined with the ability to use any number of universal, quick-hitch hydraulic attachments, the MPS can replace many single-use diesel and electric vehicles. These events mark the on-going commitment by Dannar to provide fleet managers across the U.S. with a clean, quiet, versatile work machine that could help revolutionize how our nation maintains its infrastructure. No other heavy equipment manufacturers are producing electric or electric hybrid options at this time. Dannar’s vision for the MPS dates back to 2001 and has taken many years and a few prototypes prior to reaching production this year. The company continues to grow within its current Muncie facility, but a new assembly plant will be built in 2017 on the former Indiana Steel and Wire property within theKitselman Pure Energy Park (KPEP). The Mobile Power Station is built with mostly off-the-shelf components, but all manufactured parts are being locally sourced in East Central Indiana. To date, Dannar has provided over $2 million in business to suppliers throughout the region. Tab Benoit will perform in a FREE outdoor concert as part of the 2016 Muncie. 23rd at Canan Commons (500 S. Walnut St.) in the heart of downtown Muncie, IN. Local bluesman Chad Nordhoff will open. the top ten of the Blues Album charts. 2016 artists can be found at www.munciethreetrails.com. Please join the city of Muncie as we celebrate the Fourth of July with a synchronized fireworks display by Grucci. Fireworks will begin at 10pm at the Muncie Central High School Levee. Please check the City of Muncie's Facebook and Twitter pages for weather updates. In the event of inclement weather, the fireworks show will be held the following evening. Downtown Muncie is open for business but, there will be a detour starting Monday, June 20th, 2016, at the Jackson St and Walnut St intersection. The intersection will not be open to vehicular and pedestrian traffic during construction efforts relating to the ongoing Walnut Street Streetscape Improvement. The project includes work related to MSD’s efforts to separate the combined sewer system as required by federal mandate. Traffic on Jackson Street will be routed south on High St to either Adams Street or around to Mulberry Street. Adams Street is open both ways East and West and the sidewalks along Walnut St. will remain open, allowing access to all businesses and parking. Anticipated completion of the work is scheduled by the middle of August. Maps for accessibility and parking are available for customer convenience at cityofmuncie.org or downtownmuncie.org. MUNCIE, IN - November 17th 2015 — RACER Trust and Ross Community Center, Inc. have come to terms on the sale of approximately six acres of the former GM Manual Transmissions of Muncie property off West 8th Street on the Southside of Muncie. Muncie, Indiana – July 1, 2015 – 3-time Grammy nominees The Steeldrivers will perform a FREE outdoor concert as part of the 2015 Muncie Three Trails Music Series. The concert will take place at 7 PM on Saturday, July 25th at Canan Commons (500 S. Walnut St.) in Muncie, Indiana. The Muncie Three Trails Music Series is unique in the state of Indiana as the only annual music series featuring current recording artists of national stature and critical acclaim in free public concerts. Other 2015 Series artists are Béla Fleck & Abigail Washburn, country music legend Junior Brown, and Blues Hall of Fame inductee Joe Louis Walker. Full information about the Series and all 2015 artists can be found at www.munciethreetrails.org. Muncie, Indiana- June 18th, 2015- The Cintas building has a new owner. The building which sits adjacent to Muncie’s core downtown district is now owned and operated by Sustainable Muncie Corporation, a non-profit entity organized to focus on the economic development of Muncie. This Cintas program is focused to attract and support makers of all kinds in a destination facility that promotes and enhances innovation, creativity, learning, development, and selling in order to stimulate and expand economic vitality. The building, which still bears the Cintas name, would allow the community development corporation to foster an environment of collaboration and create conditions for the innovative leveraging of resources of the City of Muncie, Ball State University and IU Health-Ball Memorial Hospital. Discussions around this concept began in October 2014, when Mayor Tyler formed, appointed and charged the Community Development Concept Exploration Committee with examining the concepts of a local maker’s district, in which artisans and manufacturers make distinctively local products; an arts district, in which artists reside in a particular sector of the community and practice their craft; and an innovation district, where technology and innovation-driven start-ups congregate and pursue their ventures. Early partners in the discussions included representatives from Ball State University, Ivy Tech Community College, Ball Brothers Foundation, Community Foundation, First Merchants Bank, Flatland Resources and Muncie Arts & Culture Council. The Cintas building, which is more than 85,000 square feet, had been vacant for approximately four years and, as the discussions continued, it emerged as a site that could accommodate collaborative ideas for arts and culture, innovation, research and development, demonstration, experimentation and strong community partnerships. This mission of Sustainable Muncie Corporation relies on collaborative partnerships between the community’s anchor institutions (i.e., Ball State University, IU Health-Ball Memorial Hospital, and the City of Muncie), local foundations, non-profit partners and Muncie neighborhoods. 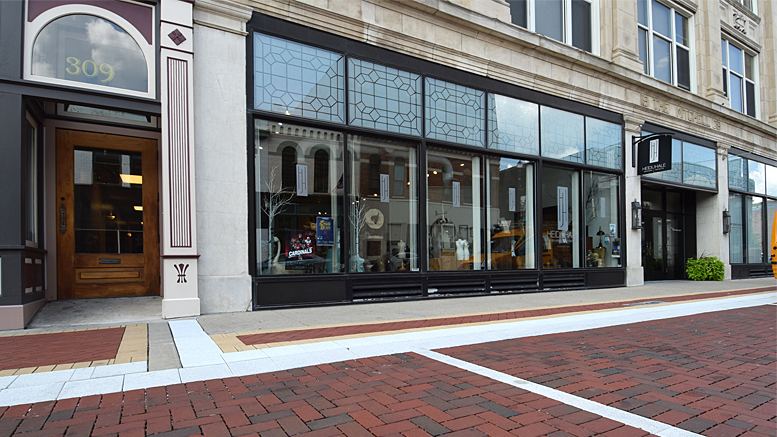 “This inaugural project of Sustainable Muncie focused on the long tradition of maker culture in Muncie can only be a success with the engagement of these key community partners”, said President, Michael Wolfe. The initiative is firmly rooted in the concept of “primacy of place” – the belief that quality-of-life improvements are one of the most effective ways to create and sustain a vibrant and prosperous community. Ball State University welcomes the opportunity to be one of the community partners of the Sustainable Muncie Corporation in promoting downtown re-development of the former Cintas facility into an emerging “Maker’s Space” for entrepreneurship, innovation, creativity, learning and development . Consistent with Ball State’s refreshed vision in The Centennial Commitment (18 by ’18) to be the most student-centered and community engaged of the 21st century public research universities, the university viewed this one-time capital investment to revitalize the Cintas facility into a public-private partnership for economic development as a great opportunity to support its community-engagement commitment and elevate our participation in Muncie. Through Ball State’s investment along with other community partners, the Sustainable Muncie Corporation will begin to reconfigure the former Cintas facility so future commercial and private sector tenants can begin leasing the space. In addition, Ball State University faculty and staff commitment to community engagement and primacy of place projects can apply for short-term funding from the newly created Centennial Commitment Academic Excellence Grants to fund start-up entities in support of this enterprise. When fully operational and successful, the Cintas building operated by Sustainable Muncie would not only be contributing to the vitality and vibrancy of the larger community, but enhancing the value and reputation of the very anchor institutions that gave it life. Muncie, Indiana - June 18th, 2015 -The City of Muncie, Indiana is standing in solidarity to share our support and prayers for the community of Charleston, South Carolina and victims, families and friends of the tragedy at the Emanuel AME Church. The Honorable Mayor Dennis Tyler has asked all flags to be flown at half mast for the next 72 hours and City Hall will be lit in orange to honor all victims of gun violence everywhere. Please join us in sharing your support for the community of Charleston and victims of gun violence by wearing the color orange. Thank you, God bless Muncie, God bless Charleston, and God bless the USA! Muncie, Indiana - June 1, 2015 - 15-time Grammy winner Béla Fleck, with his wife, Americana artist Abigail Washburn, will perform in a FREE outdoor concert to start the 2015 Muncie Three Trails Music Series. The concert will take place at 7 PM on Thursday, June 25th at Minnetrista campus (1200 N. Minnetrista Parkway) in Muncie,Indiana. Béla Fleck is considered to be the best banjo player in the world. Through his explorations of Classical, World, Pop, Country, Folk, Blues, and Jazz, Fleck has revolutionized the banjo by carrying it far beyond traditional Bluegrass, the music with which it is most commonly associated. He has been nominated in more Grammy categories (over 40!) than any artist in Grammy history. Along with his wife, banjoist Abigail Washburn, the duo’s current tour explores a variety of musical genres with striking virtuosity and unparalleled originality. They have played the finest concert halls in the country, including New York’s Carnegie Hall and Nashville’s Ryman Auditorium, along with unconventional venues such as the Beijing Olympics. On June 25th, it is Muncie’s turn to welcome this incredible musical team to our city for a free, outdoor concert. The Muncie Three Trails Music Series is unique in the state of Indiana as the only annual music series featuring current recording artists of national stature and critical acclaim in free public concerts. Other 2015 Series artists are bluegrassers The Steeldrivers, country music legend Junior Brown, and Blues Hall of Fame inductee Joe Louis Walker. Full information about the Series and all 2015 artists can be found at www.munciethreetrails.org. Muncie, Indiana – April 14, 2015 – The 2015 Muncie Three Trails Music Series features 4 critically acclaimed national recording artists in a series of FREE concerts. This year’s featured artists include 15-time Grammy winner Béla Fleck, alongside his wife, Americana artist Abigail Washburn, on Thursday, June 25th; bluegrass Grammy nominees and IBMA award winners The Steeldrivers on Saturday July 25th; Country Music Association award winner Junior Brown on Saturday Sept. 5th; and two-time W.C. Handy award winner and Blues Hall-of-Fame inductee Joe Louis Walker on Saturday October 3rd. All concerts start at 7 PM. The Muncie Three Trails Music Series is unique in the state of Indiana as the only annual concert series featuring recording artists of national stature and widespread critical acclaim in free public performances. All concerts take place outdoors at the Canan Commons performance stage in downtown Muncie or on Minnetrista campus, located just off the White River Greenway trail. As indicated by its name, the Muncie Three Trails Music Series also encourages attendees to experience the many recreational and cultural amenities Muncie has to offer along the White River Greenway, Cardinal Greenway, and Muncie Arts and Culture Trails. Hence, the slogan for the series is “Explore the Trails, Enjoy the Music”. The Muncie Three Trails Music Series is a non-profit joint project of the Muncie Downtown Development Partnership, the Muncie Arts & Culture Council, and Rick Zeigler, series founder and organizer. Full information can be found at ww.munciethreetrails.org.